Mrs. Fatima Jibrell founded Adeso in 1991 (previously Horn Relief) with a vision of a peaceful and healthy Somalia. Adeso played a key role in developing an indigenous environmental movement in Somalia, and gained international acclaim for inspiring social and political change. Jibrell worked on educating rural pastoral communities, and has faced war, drought and harassment in a prolonged effort to organize women and protect Somalia’s natural environment. Moreover, she plays an active role as a member of both the Kenya and US Board of Directors. Through her efforts, charcoal trade ended in North-Eastern Somalia, which equally led to the Puntland Government prohibiting the export of charcoal through the Bosaso Port in 2002. 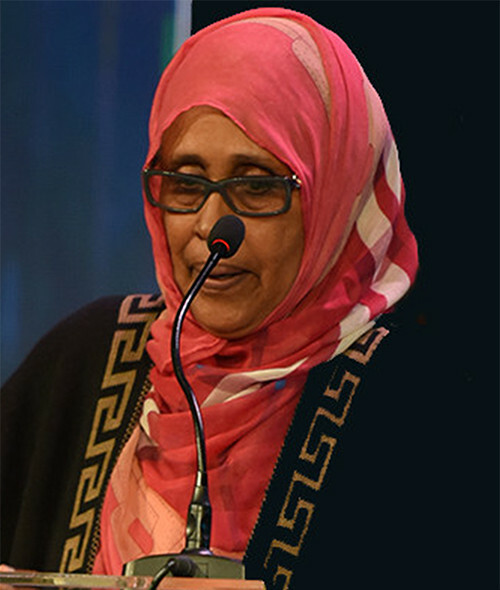 She was awarded the Goldman Environmental Prize, the National Geographic/Buffet Award for Leadership in African Conservation, and the 2014 Champions of the Earth award for her effort to protect Somalia’s fragile pastoral environment (the United Nations’ flagship environment award that recognizes outstanding visionaries and leaders in the fields of policy, science, entrepreneurship and civil society action).